Cats are enigmatic creatures in that they can shift from refined to uncouth in the blink of an eye. Their self-grooming best showcases this paradoxical nature. One moment they may be elegantly perched on the windowsill, the next moment they’re awkwardly twisting their head to lap at a spot on their neck (unpleasant smacking sounds included). Many species engage in personal grooming, but cats are among the most meticulous offenders. Adult cats spend an average of 30 to 50 percent of the day grooming themselves. So what purposes does this habit serve? A cat’s tongue distributes natural oils that help clean and smooth out the fur. These oils also ensure the coat is protected from dampness. 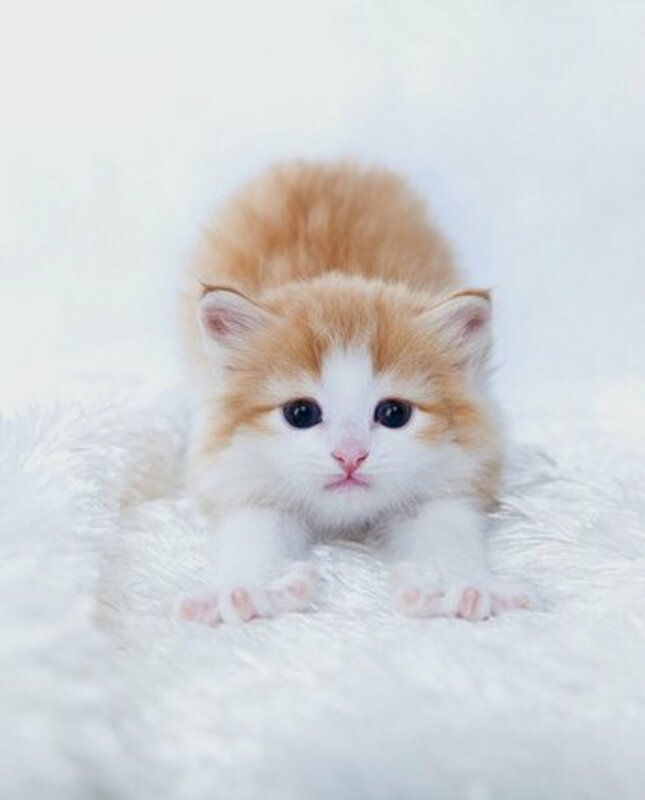 Cats cannot sweat the way humans can, but they can emulate the process by grooming themselves. The saliva they spread over their fur evaporates and cools them off, regulating body temperature. A cat’s tongue is equipped with small, backward-facing barbs called papillae. Much like particular types of massages stimulate blood flow in humans, these barbs improve cats’ circulation when stroked over the skin. Dogs aren’t the only pets who lick their wounds. Cat saliva contains antiseptic tissues like lysozyme that protect against infection and promote faster healing. However, it’s worth noting that too much licking can exacerbate the condition. The bacteria from a cat’s mouth can reopen wounds and worsen infections in excess. If your cat is continually licking the same injury, especially if it’s to the point of hair loss, see a veterinarian. Grooming has psychological benefits as well. The repetitive ritual of self-grooming stimulates endorphins, making it an easy way for cats to unwind, relieve stress, and calm themselves down. Ever noticed how often cats will suddenly stop whatever they’re doing to groom? Nearly any activity can be interrupted by an impromptu licking session—eating, stalking prey, cuddling with their human, play-fighting with another cat, et cetera. Are cats just overwhelmed with the urge to clean themselves at odd times? Sometimes. Usually, though, this abrupt grooming is what is called a displacement activity. A displacement activity is a seemingly out-of-context or irrelevant response to a situation, usually resulting from conflict or uncertainty. These activities are “displaced” in that they don’t serve any real biological purpose to the situation at hand. This phenomenon isn’t limited to felines—nervous habits like nail biting, head scratching, and leg jiggling are common examples of human displacement behavior. 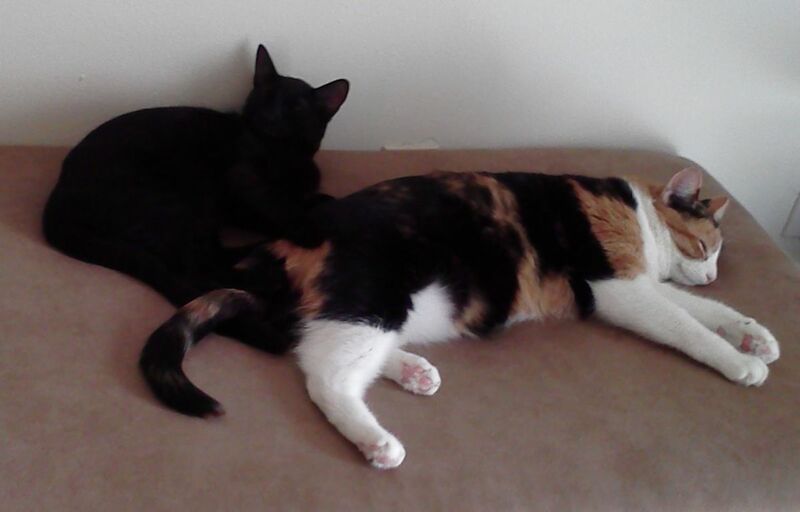 Cats often engage in displacement grooming to mitigate feelings of stress, conflict, anxiety, or frustration. For example, a cat may see another animal in their vicinity and be uncertain if they should approach it or run away. So they take a temporary third option—grooming themselves. 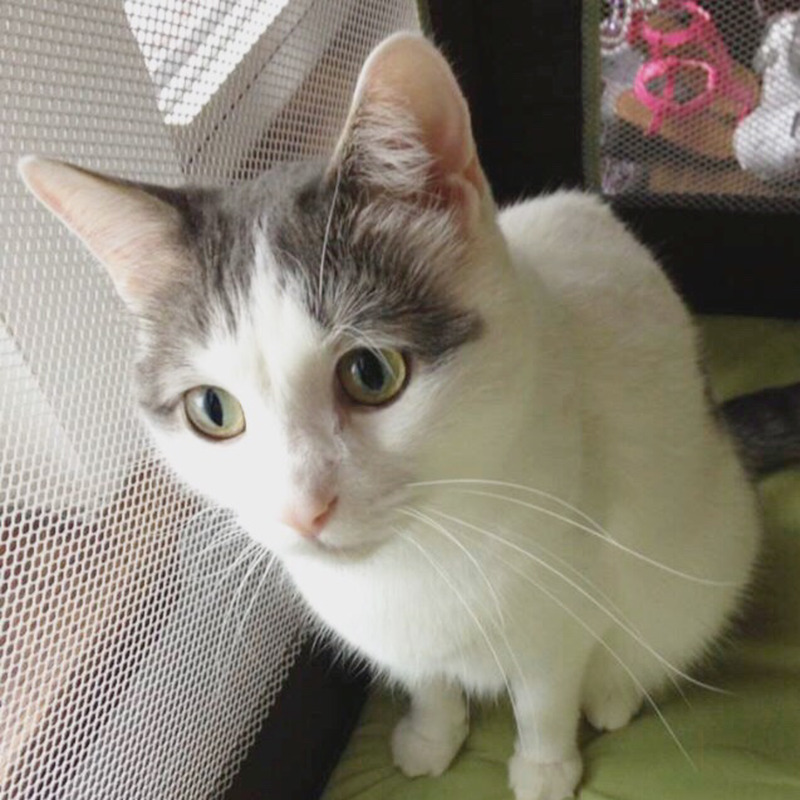 Displacement behavior can also occur when a cat wants to do something but is obstructed by their environment, for example, being unable to pursue a bird they see outside a window. In some cases, displacement behavior can take place after a cat fails to achieve something. A cat attempting to make a risky leap from the counter to the refrigerator and falling short may sheepishly lick themselves afterward, either to assuage embarrassment or simply because they are unsure of what to do next. Cats obviously have good reason to frequently groom. But how much is too much? When does a cat's grooming cross over from habitual to excessive? Grooming is normal feline behavior, so it’s difficult to ascertain if a cat is overdoing it or not. 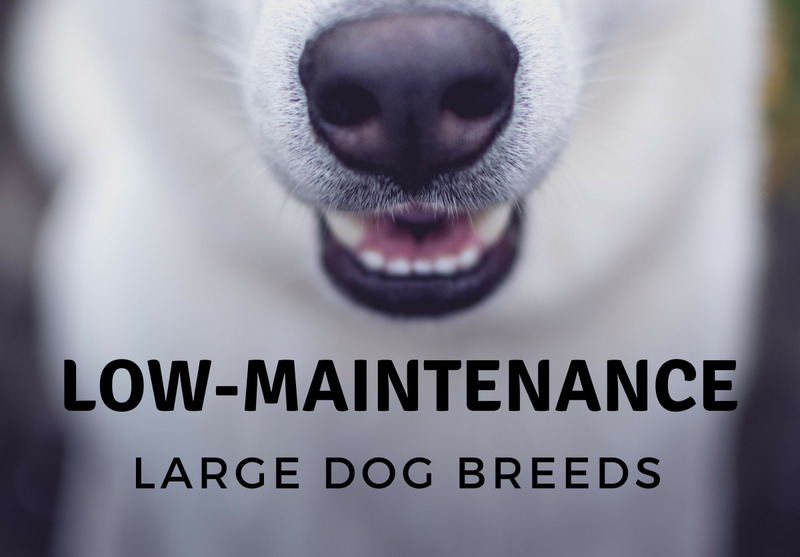 The major signs to look for are excessive hairballs, areas of thinning or balding fur, and skin lesions. Hairballs are the main drawback to all that licking. The papillae on a cat’s tongue are what give the tongue its trademark “sandpaper” texture, acting as a hairbrush for cats. A cat’s tongue can’t be rinsed or replaced the way a hairbrush can be, nor can cats simply pick leftover hair out of their tongues as humans can. 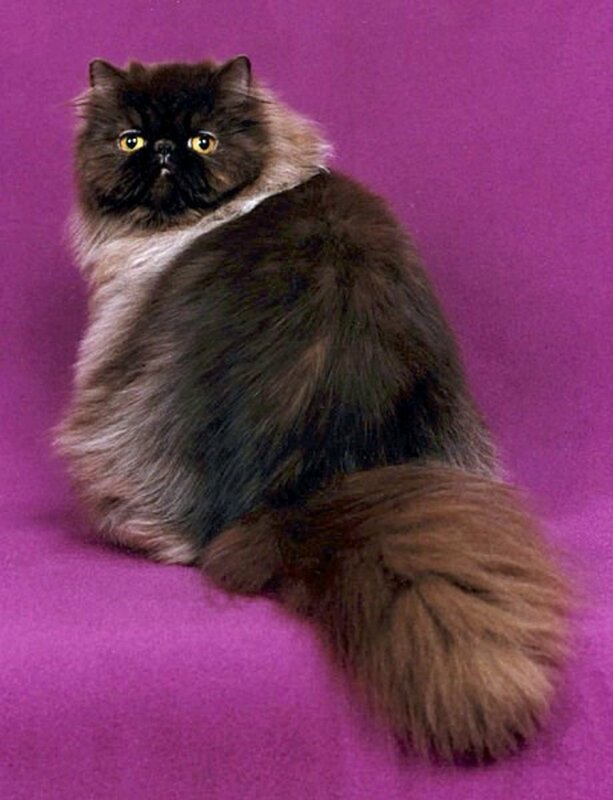 Most of the time, that excess fur will simply be swallowed and make its way into the cat’s stomach. In moderation, hair in the stomach isn’t an issue—but as we know, a cat’s grooming far surpasses “moderation.” Once that hair accumulates and grows into a ball, it becomes too much for the cat's digestive system to handle and is forced out, resulting in the lovely clump of hair lying on the couch, or the bed, or the new DVR. 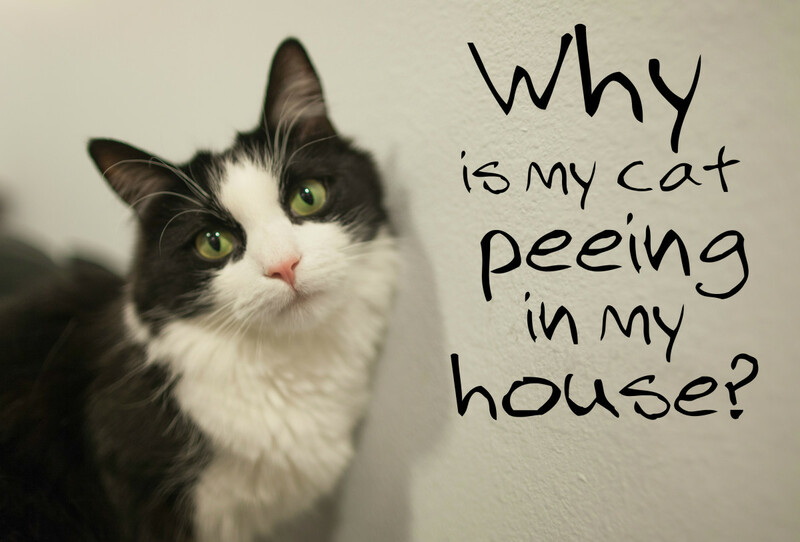 Hairballs are unpleasant for cat and owner alike, but typically not a cause for concern. They're a normal part of cat ownership. 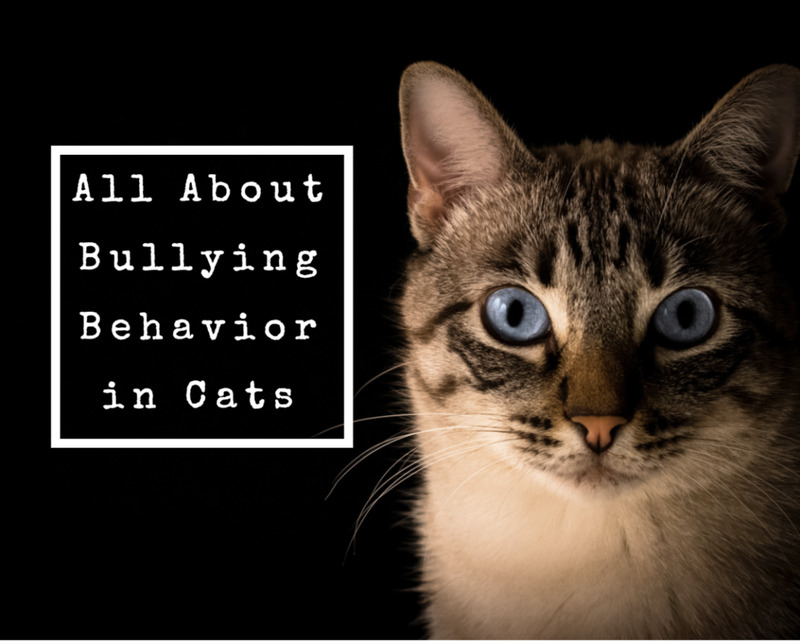 However, regularly combing your kitty, making sure they’re receiving enough water, and implementing specialized “hairball formula” food into their diet, are all ways that can help reduce the frequency. If your cat is still throwing up hairballs more frequently than is normal, over-grooming may be the culprit. 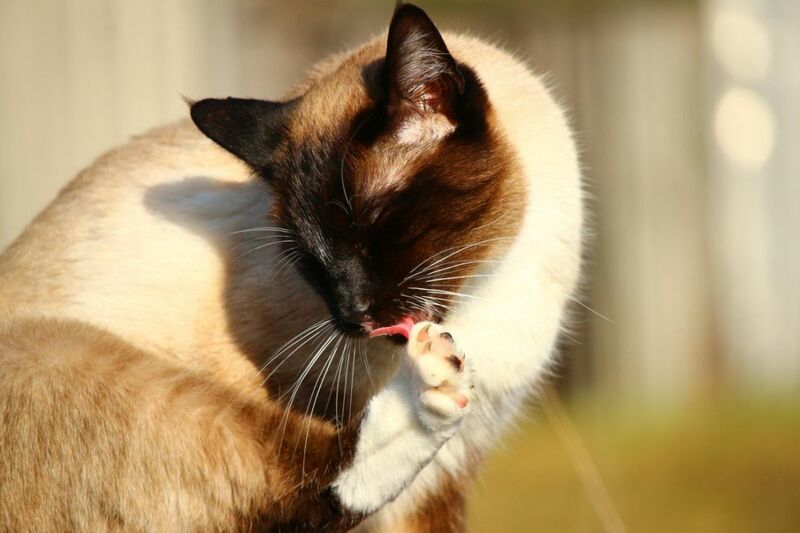 Bald or thinning patches of fur are another sign a cat is grooming more than is warranted. These patches can appear anywhere a cat’s tongue can reach, but the belly, legs, and abdomen are among the most common places they are found. Areas of over-groomed, thinning hair often have a sharper, spikier texture than the rest of the cat’s coat due to damaged fur shafts. Cats who over-groom may also develop skin lesions and/or areas of inflammation from licking themselves raw. Open sores can become infected, which will prompt the cat to lick even more and exacerbate the infection, leading to a vicious cycle of over-grooming and infection. 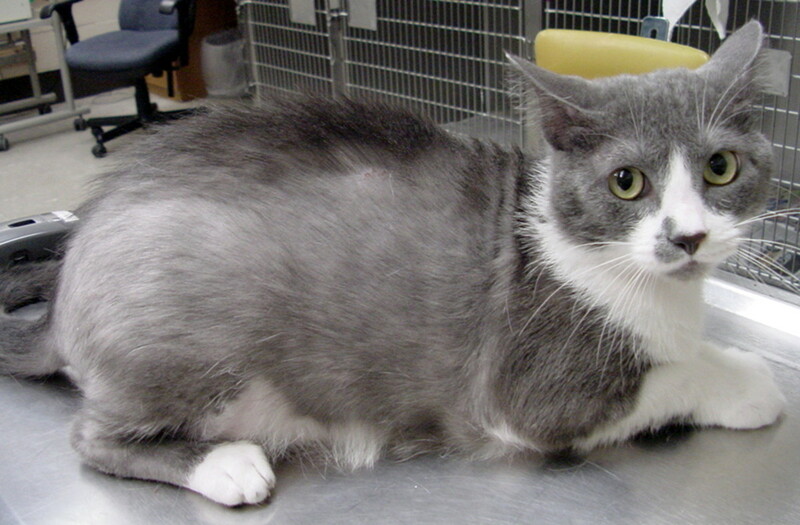 If your cat has over-groomed to the point of self-injury, seek veterinary treatment for the wounds as soon as possible. Over-grooming in cats can have physical or psychological roots. Medical reasons for over-grooming include allergies (to fleas, food, etc. ), ringworm, cystitis, and hyperthyroidism, among others. Consult a veterinarian to determine if your cat has any of these medical issues. If physical health problems have been ruled out, the grooming may be psychological in origin. Psychogenic alopecia is the medical term for obsessive grooming in cats that stems from a psychological cause rather than a physical one. The major behavioral reason for over-grooming is stress, usually due to change of some kind. 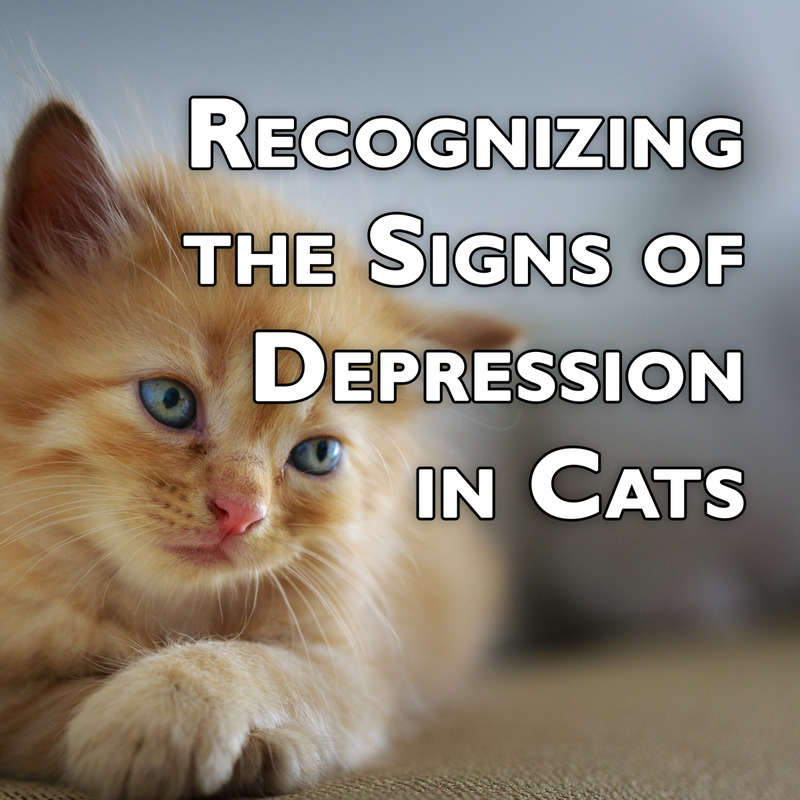 Cats favor routine, and disrupting that routine can be a strain on their emotional health. Common sources of stress include moving to a new house, the addition or loss of a family member or pet, home remodeling, and changes in schedule. Grooming as a relaxation ritual is not inherently harmful, but if a cat is continually stressed, their self-grooming may become compulsive to the point where any form of conflict causes them to retreat to the behavior. This is when veterinary assistance should be sought out to identify the sources of the stress and address ways to remove or minimize them. Wow, all these benefits i was think it's about cleaning. Great hub.